Simon Says Wrap it Up! This week the challenge is wrap it up! This is my take on the Wrap it Up challenge! I LOVE May Arts gold metallic twine. There is a silver one too. These are perfect addition to holiday card to add a touch of gold. That is what I have done on my holiday card. I have used the new background stamp called Lattice Grid from Simon Says Stamp Create Joy collection to white heat emboss and watercolour using Zig Clean Brush pens. I then trimmed the panel quarter inch smaller than the card front. The second panel is made by die cutting a stitched rectangle using the Simon Says Stamp Stitched Rectangles die set. I then used the Stitched Christmas Tree die to die cut in the centre of the panel. I left the die cut inlaid in its place by adhered an adhesive sheet behind the panel. I also die cut the Christmas Tree using green glitter adhesive paper. I removed the adhesive and adhered the green glitter tree over the inlaid white tree to give added dimension. For the sentiment I stamped the sentiment from Holidays Hellos stamp set from Simon Says Stamp and adhered on the centre of the tree. Wrapped the May Arts Gold twine around the panel and made a bow. I also cut out couple of leaves from one of May Arts leaf ribbon, coloured the white leaves with Simon Says Stamp Jellybean ink pad and adhered to the centre of the bow with a big red rhinestone. Embellished with Pretty Pink Posh red metallic sequins. I layered the two panels and adhered them on to a white card base. Here is a closeup! Hope you like my take on the challenge. So now it’s YOUR turn, Happy Crafting! Beautiful card!! Love the glitter! What a fun mix of elements and happy colors, Gayatri! Love your take! Beautiful card Gayatri! Love that tree!! 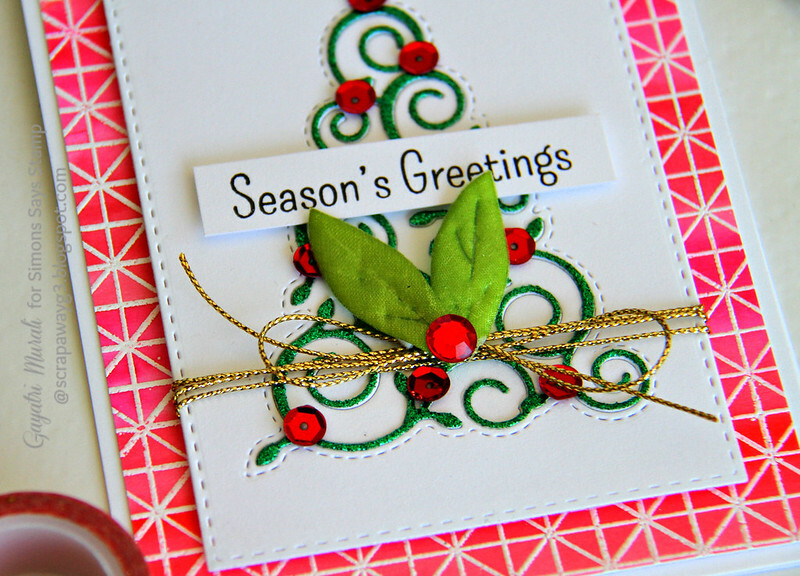 A beautiful card Gayatri, a gorgeous background and stunning Christmas tree!! Gorgeous card. Christmas is all over this card. Beautifully done. 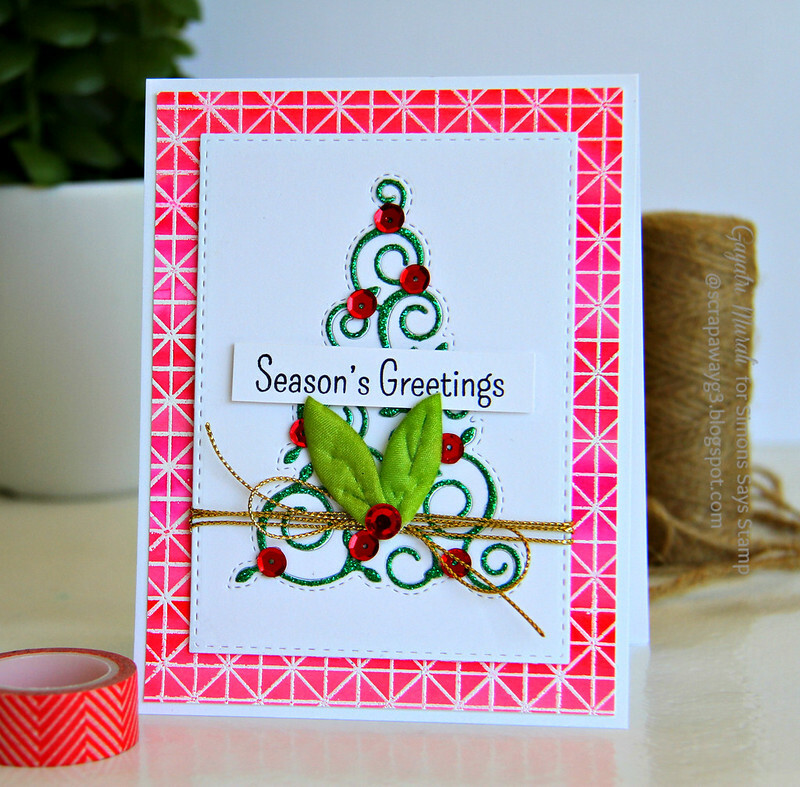 I love the look of the Lattice Grid background Gayatri and can't wait for mine to arrive 🙂 Gorgeous happy Christmas card. This is so stunning-love that Christmas tree with the red sequins.